As some people probably know by now, Troll and Toad has put most of the Boundaries Crossed set up for pre-orders. Heading into the pre-orders, there were three Pokemon in the set that I felt would be really strong and I made sure to pre-order these cards. These three Pokemon are Landorus EX, Keldeo EX, and Cresselia EX. The first two have received a lot of hype heading into the Cities format, but Cresselia EX has been a card largely ignored by the player base, and I am not really sure why. The more and more I examine these three cards, the more I feel that these are three well balanced EX’s that will join the ranks of Mewtwo EX, Darkrai EX, and Rayquaza EX in the king’s court of EX Pokemon. First, let’s take a look at Cresselia EX”s basic stats. It’s a Psychic type Basic Pokemon with 170 HP and the standard weakness to other Psychic type Pokemon. It has an Ability, Sparkling Dust, which states, “At any time between turns, heal 10 damage from this Pokemon.” It only has one attack, Psycho Defender, which costs PCCC which does 90 damage while also getting rid of Cresselia’s Psychic Weakness during your opponent’s next turn. 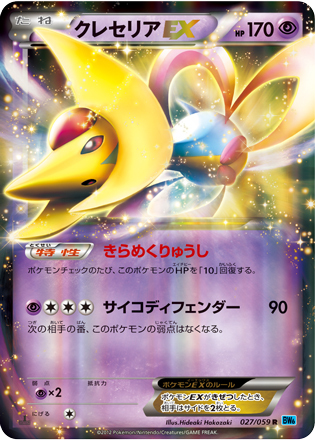 The first thing that really stands out about this card is its Ability, which can allow Cresselia EX to become a very strong tank Pokemon. While this Ability is very strong in its own right, turning Cresselia EX into a 3hko instead of a 2hko against a Pokemon like Darkrai EX, I don’t think it is strong enough on its own. To bring Cresselia EX to its fullest tank potential, it needs to be paired with other damage prevention and healing cards. The main cards that I would look to play with Cresselia are Eviolite, Potion, and Gold Potion. Its attack is also really good, especially when paired with healing cards, as you will be able to 2hko every EX Pokemon except Darkrai EX, while forcing your opponent into 3hko, 4hko, possibly even 5hko’s with all the healing cards you would also play with Cresselia. Removing weakness from itself makes this card perhaps the strongest Mewtwo EX counter in the game. There is the possibility that your opponent can play the cutesy little move of playing a double Pokemon Catcher to get around this, but this forces your opponent to waste valuable Pokemon Catcher resources and is a move your opponent will probably only be able to pull off once in any given game. And this is the beauty of Cresselia EX, if such a thing is to happen, you just go into the Mewtwo war with a new Cresselia EX, as it isn’t that difficult to power up as the majority of its Energy requirement is colorless. As its attack only does 90 damage, I would look to play a healthy Tool Scrapper count in any deck playing Cresselia EX. Tool Scrapper keeps your opponents EX”s in 2hko range (except for Darkrai of course) and can also be used to counter Garbodor, as that evil pile of garbage shuts off Cresselia’s Ability. The strongest counter to Cresselia EX in the current meta game is going to be Rayquaza EX, as it has the Ability to ohko Cresselia EX with Dragon Burst, completely nullifying the tank strategy. The other main EX threats for the card are going to be Darkrai EX, as it resists Psychic and Keldeo EX, as it is able to accelerate damage with its attack as well, which can help to nullify the tank strategy. Now that all of the basic strengths and weaknesses about using Cresselia EX are out of the way, it’s time to start looking at ways in which a deck built around Cresselia EX could be done. A deck that uses Cresselia EX is going to want to be able to power it up in one turn, as leaving Cresselia on the field and not attacking is not a good strategy as it becomes very easy to knock out with Mewtwo EX at that point. This means you will want to play Cresselia EX with some form of Energy Acceleration. Eelektrik is an option, but I question the viability of Eelektrik decks heading into next format as Landorus EX makes such quick work of any Tynamo/Eelektrik that get onto the field. Ho-Oh EX or Dark Patch in conjunction with Energy Switch is going to be too inconsistent for a card that has such steep Energy cost and the condition that you pretty much need to be attacking with it when it’s on the field, so those are also non-options. That leaves us with Blastoise BC and Emboar BLW as our two options for Energy Acceleration. I think Blastoise is the better option because it is easier to get out a Blastoise thanks to Squirtle’s Ability, and it also is able to take advantage of Keldeo EX to get Blastoise out of the active spot. 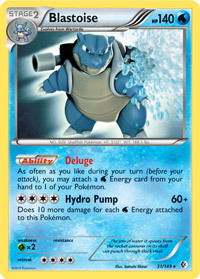 Using Blastoise means we will have unlimited water energy acceleration from the hand, which means a somewhat high Water count should be played in the deck to allow for you to hit three Water often enough in a turn to power up Cresselia EX in one turn. Psychic Energy will also be needed, I think somewhere around five should be good for the deck. I don’t think Cresselia EX and Blastoise by themselves are going to be enough to form a viable deck, and they will need some other partners to work on getting the job done. We are using Psychic and Water energy, so we can take advantage of any Pokemon that has those two Energy requirements. Rayquaza EX is an opposing threat, so it would be good to find some counters to it to pair with Cresselia EX so as not to get ran over by a Rayquaza EX. Kyurem NVI – Kyurem would be a good counter to most evolution based decks (with the exception of Squirtle because of its Ability). 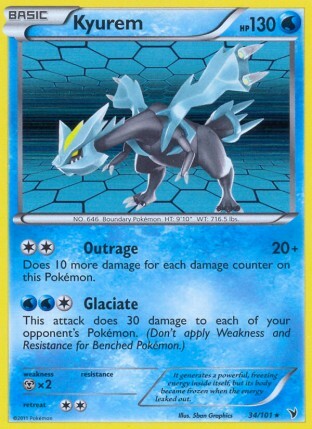 A few turns of using Glaciate against an Eelektrik deck for example will clear their field of any Eelektrik in play, which makes Kyurem a strong counter to Eelektrik decks which could help this deck against Rayquaza EX, as the card cannot function well without its energy acceleration. The spread damage can also be really strong in setting up knock outs for your other Pokemon. Articuno NXD – Articuno is a water type Basic Pokemon with 120 HP, and its first attack, Ice Beam costs WCC and does 50 damage, flip a coin, if heads the defending Pokemon is paralyzed. Articuno could be paired in this deck with Victini to act as a Darkrai EX counter and also a general staller against most decks in the format. The idea of having a stall Pokemon to put together with Cresselia EX isn’t a bad one. If Cresselia EX gets too much damage on it, you can work on stalling your opponent by paralyzing their Pokemon so that they cannot attack to buy time for Cresselia to recover some of its HP. Mewtwo EX – Cresselia EX could have problems with Keldeo EX’s that get too big and accelerate damage too fast on Cresselia. Mewtwo EX is very strong counter to Keldeo EX’s that get built up with too much Energy, and if your opponent decides to go Mewtwo EX to counter your Mewtwo EX, you then just switch over to Cresselia EX to finish off the Mewtwo war. Regigigas EX – This card is really good against Blastoise decks. You can eat up any Squirtle that your opponent has in play with Giga Power. From there, Regigigas puts the Keldeo player in an awkward position. If they hit into it for any significant damage, their Keldeo is just going to get knocked out on the next turn with Raging Hammer. If they build up a Keldeo EX large enough to ohko Regigigas EX, then you would be able to knock that Keldeo EX out with Mewtwo EX very easily. 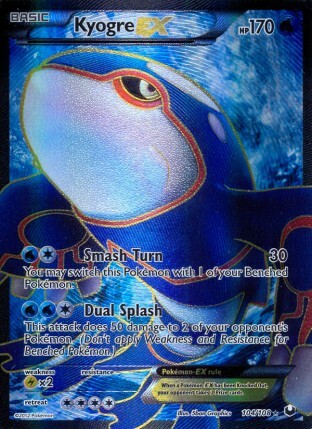 Kyogre EX – This Pokemon would fill the same role as Kyurem for the most part. In some ways it is better, being able to instantaneously knock out two Tynamo or two Oddish is really great, and getting off two Dual Splash on EX’s is defeinitely stronger than a couple of Glaciates. However, I am not sold on Kyogre EX. A lot of Basics of pre-evolutions right now have 60 HP, which means it will take either two Glaciate or two Dual Splash to knock them out. I prefer Glaciate over Dual Splash in these situations as I would be able to spread damage to the support Pokemon as well as my opponent’s attackers. Honestly, in such a deck I would love to play both Kyurem and Kyogre EX, but I feel as space would be too much of an issue to make this happen. Blissey DEX – Blissey has an Ability, Softboiled, which allows you to flip a coin and if heads, heal 30 damage from your Active Pokemon. The idea would be to place 2-3 Blissey on your bench and try to use them as additional healing for Cresselia EX. This probably takes up too much room in the deck to be a very viable option. Sigilyph DRX – This deck can setup a Sigilyph easier than most, and Sigilyph is still a strong card to play down against EX heavy decks. Bouffalant DRX – This gives a three Energy attacker that is able to ohko a Shaymin EX. Is this card even needed when you can knock out Shaymin EX with Keldeo EX for the same cost, while still being able to knock out an Eviolited Shaymin EX just by attaching another Energy? 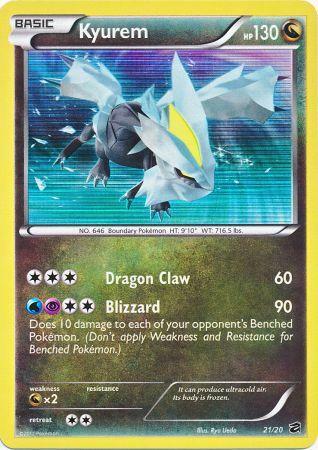 Kyurem DV – It seems as though most people have written off ever using Kyurem’s second attack in a deck, but low and behold, here is a deck concept that can make great use of it. Blizzard costs WPCC and does 90 damage, plus 10 damage to each of your opponent’s benched Pokemon. 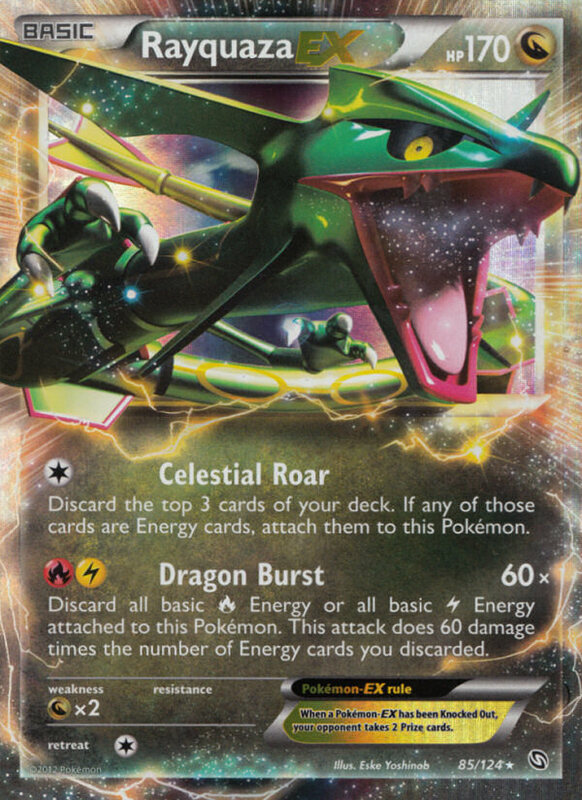 This card would make another strong counter against Rayquaza EX, giving you an option to ohko it. The card can also ohko White Kyurem EX and Black Kyurem EX, which could be a big deal for this deck, as one of them can ohko any EX Pokemon in the game with their Ace Spec. With all of the above factors taken into account, here is what I am thinking of running in the deck attacker wise and Energy wise to try to bring this concept together, as well as the healing cards I would like to play in the deck. This already puts the list for this deck at 42 cards, which leaves just 18 spots remaining in the deck for everything else it needs. At least 13 of these slots would be dedicated to Supporters, so that only leaves 5 spots left for my Pokemon Search as well as other tech trainer cards like Pokemon Catcher, Switch, Energy Retrieval, and Super Rod. It’s very clear from the get go in making this deck that I am going to have to start making some sacrifices. Are there any Pokemon techs that aren’t really needed? That will need to be examined. Do I cut back on my number of additional healing cards? I don’t think the Energy can be scaled back too far, but 14 seems like it could be a comfortable number in a Blastoise deck, but this does make the deck less consistent in being able to setup Cresselia EX in one turn. Over the next few weeks, I am going to be throwing this deck through various testing to try to figure out the answers to what and what isn’t needed in the deck, as I think a Cresselia EX centric deck has the potential to be really strong in the current meta game. 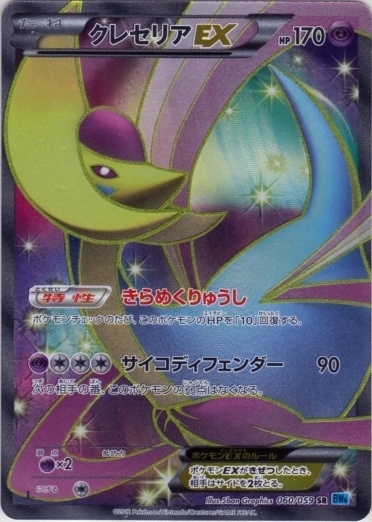 Cresselia EX will also see some play in other decks as more of a one-of tech, in which the deck’s strategy isn’t really all that built around it. The decks that use Cresselia EX are all going to be Energy Acceleration or Manipulation decks. Eelektrik and Blastoise decks that opt to play Prism Energy can tech in a Cresselia EX as their Mewtwo EX counter, and as just another attacker that they hope can exchange favorable with an opponents EX with its Ability reducing damage in between turns. The card could also see play in both Hydreigon and Klinklang variants as their Mewtwo EX counter. As I said in the intro, Cresselia EX was one of the three EX’s I made sure to pre-order from this set, as I feel it has the potential to be really good. If you haven’t pre-ordered them yet, I recommend you do so now, as I can’t see it really getting much cheaper than it is now at $8.99. The card has some of the best tank potential in the format and it is the best hard counter to Mewtwo EX that we have received so far. If you have some extra money on hand, you might want to look at buying a playset of the Full Art Cresselia EX’s. I think the Full Art is going to take claim over the title of “Most Beautiful Card In Format”, stripping the title away from the Full Art Mew EX. I am pretty excited about Cresselia EX too! Other than in Klinklang or Hydreigon, I don’t see all that much promise for putting Cresselia EX in other decks (except for maybe with Gardevoir). I’m surprised you didn’t bring up Gardevoir with Energy Switch! What do you think about that? I really am not a fan of the Gardevoir idea. If they knock out your Gradevoir, you can easily be left with a Cresselia that can’t attack. The deck as a whole seems too vulnerable to Mewtwo for my liking. awesome website man! i like the easy navigation from page to page. You forgot to mention the best partner for Cresselia EX and Mewtwo EX.. Gardevoir! for only 2 psy energy your hitting for 90 with cresselia or 80 with mewtwo and with energy switch you can easily transition between the two. Gardevoir is a very weak stage 2 but unless your hitting it with a mewtwo its still a 2hko and you can just keep swinging with a huge mewtwo or cresselia and max potion the gardevoir. I would like to go over my deck list with you sometime if your up to it. Thank You! I’ve been doing my best to try to make this site look pretty and still being easy to navigate. I hope that I’ve been somewhat successful in this, as it was a big part of my college major looking at this type of stuff. If you have any suggestions on anything that could be improved with the site, I’d love to hear it. As far as Cresselia EX with Gardevoir and Mewtwo EX, I’m still not exactly sure how I feel about the deck. One of my friends had the deck built, and I wasn’t having too difficult of a time being able to beat it with my Ho-Oh EX deck just using an aggressive Mewtwo EX strategy, along with some attacking from Terrakion and Ho-Oh mixed in to shake it up. Mewtwo EX can counter Cresselia EX fairly well, with double catcher plays, or just x-balling it for absurds amount of damage with X-ball. The deck did feel like it was at least a Tier 2 concept in the games we played against it. I could see it being really strong if the list can be nailed down for the deck. I think that’s going to be highly important, just because of how fragile Stage 2 decks can be. I’d be down for going over the list with you at any time too!